Are you a lover of wonderful jewelry ? This amazing book by Lark Jewelry & Beading will be the perfect book to have. I have always loved the mystery about the relationship with the cultural influence in jewelry and this fantastic book will take you from Art Nouveau, circa 1890 to present day. The author, Caroline Cox, is a leading fashion authority whose work explores the relationship between fashion, beauty and culture. 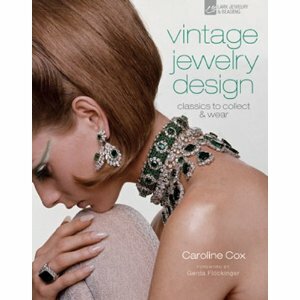 The book covers more than 100 years of jewelry history, focusing on different designers and trends of each decade. I enjoyed so much looking at the trends in each decade and falling in love all over again with some wonderful designs. The pictures of the jewelry are incredible, rare pieces from museums and private owners will take your breath away. Here you have three of the images in this great book, the information at the bottom of each picture comes from the book. The large ruby and diamond "wrapped heart" brooch of 1941 by Fulco di Verdura in 18-karat gold and platinum, set with 62 cabochon rubies and 232 round diamonds. Originally commissioned by a wealthy Palm Beach client as a Valentine's Day present for his wife, this became a trademark piece of the jeweler's. 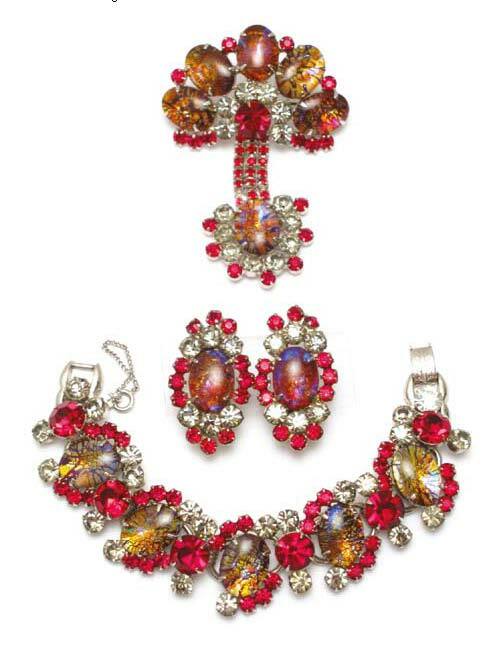 A Juliana parure of brooch, clip earrings and bracelet in silver-tone with grey chatons and ruby red rhinestones with central cat's-eye cabochon stones. Juliana was made by William DeLizza and Harold Elster of New York and sold to other jewelry companies and was marked by a paper tag. It is recognizable by incredible colorful art-glass stones. American costume jewelry in the 1940s was exuberant and glamorous. Cocktail jewelry was designed to turn heads and discretion was definitely not the order of the day. This jewelry ensemble dates from 1941. The book includes a shopping guide that gives tips and other important facts that collectors should know before buying. The publication date will be April 2011. You must get this gorgeous book !! Believe me, you will fall in love with it. 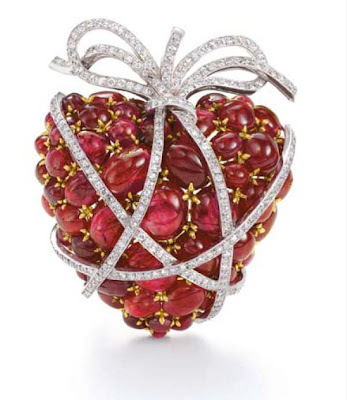 that heart looks like a large red berry, just lovely...it's hard to imagine the amount of stones that go into a piece like this, let alone the time it takes to create it. I know !!! It is an incredible piece !! the book has so many wonderful pieces ! How would it look like if that brooch is worn together with a blue cocktail dress? It must be amazing to see someone walk in wearing that brooch on a party.